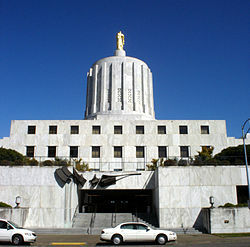 Salem (IPA: [ˈseɪ lm̩]) is the capital city of the state of Oregon in the United States of America, and county seat of Marion County. As of 2003 it has 142,940 people living in it. It is in the Willamette Valley. This page was last changed on 25 May 2018, at 10:57.